mentum until the opening between the barrel and bolt is sufficient to permit feeding. As the bolt moves back, the spent cartridge case is extracted from the chamber and ejected and the bolt driving spring is compressed. This spring is relatively light and its only function is to assist the return movement of the bolt. Therefore, the driving spring does not absorb any great portion of the kinetic energy of the recoiling bolt and the bolt moves through its entire recoil distance at high velocity. The bolt then strikes the backplate buffer and rebounds (fig. 3-6D). The forward velocity of the bolt immediately after leaving the backplate buffer is somewhat lower than the velocity at which it strikes the backplatc bccause the impact is not purely elastic and some energy is lost as heat in the exchange. 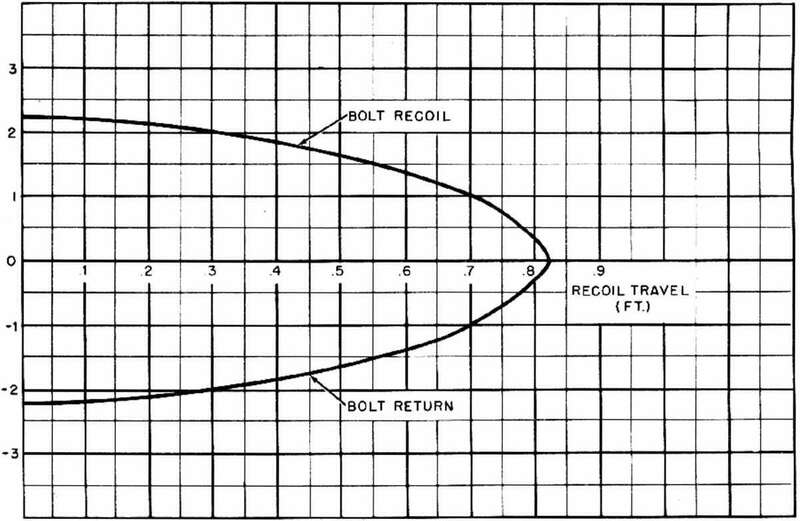 NOTE: It is important to realize that the velocity with which the bolt strikes the backplate buffer will depend on the condition of motion of the gun at the instant of impact. If the gun happens to be moving forward at this instant, the impact velocity will be higher than if the gun were stationary or moving rearward. It can be seen that if the gun motion is not controlled to insure uniform velocity at the instant of contact, the bolt impact will he entirely unpredictable and will vary widely from shot to shot. This could give very erratic performance and may result in a high incidence of parts breakage.